«A house is not where a man closes in. It is where Man opens out to his inner self». This is how Mozambican writer Mia Couto understands the notion of “house” in fellow countryman Carlos Nogueira’s work. This sculptor’s inventiveness and poetic imagination extends to drawing, painting, performance, sculpture and architecture (in co-authorship). Interested in natural materials and phenomena, as well as in subject matters and shapes rooted in primordial cultural memories and rituals, he has delved into the relationships between construction and legacy, architectural vs. natural spaces. Using wood, stone, iron and glass as his materials of choice, Nogueira’s pieces speak about the home and the road, usually calling the inhabitable space into play and blurring the traditional lines between inside and outside. 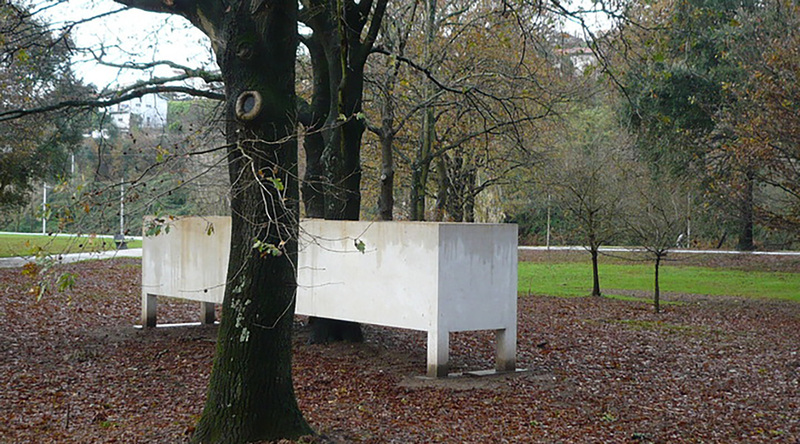 Casa comprida com árvore dentro [Long house with tree inside] is another speculative inquiry into space, the house, and their relationship with nature. A tree inhabits a house. The tree becomes a house. All possible metaphors point to the vanishing boundaries between inside and outside. In the words of the artist himself, the piece is about «building a space within and another space without / as autonomous as they are complementary / where the order in which they are approached / is completely random». Although the house may be seen as shelter and haven, with doors and windows open onto the world, Nogueira shows that that world may be deep, immense interiority. As a work of art, then, the house allows for a two-fold construct: a personal, intimate relationship with the piece, as well as a communal relationship rising from a shared ludic experience. As a consequence, intimacy is not only found inside the house, but out in the street, where we encounter others and, especially, ourselves.